The announcement on the Northwest Rail Link (NWRL) and how it will fit in with the rest of the rail network contained a number of broken promises. Promises to use double deck trains rather than a single deck metro, to not privatise rail, and to run the NWRL directly into the CBD. Of these broken promises, the first hasn’t caused much angst other than a perceived reduction in seats, but as Premier Barry O’Farrell has pointed out: services every 5 minutes means there will actually be more seats available than with services running every 15 minutes. The second broken promise is a grey area, and comparisons have been made to the Airport Line, with its privately owned stations and $11 access fee ontop of the regular fare. While the NWRL will be privately operated, the government will still own the infrastructure: stations and rolling stock, as it does with ferries, all non STA-buses and the light rail (all of which are also privately operated). This means that fears of additional access fees, as happens on the Airport Line, will probably not happen, especially given the government knows how unpopular such a decision would be. However, it’s the final broken promise that will probably get traction: no direct services into the CBD. It’s understandable why people are angry about this. If passengers have to get off at Chatswood, and North Shore trains already run at an average of 110% capacity, then how will they handle all the passengers from the NWRL unloading off a train every 5 minutes? The problem with this thinking is that it assumes that one variable will change (number of trains from the NWRL) while another remains static (number of trains from the North Shore Line). 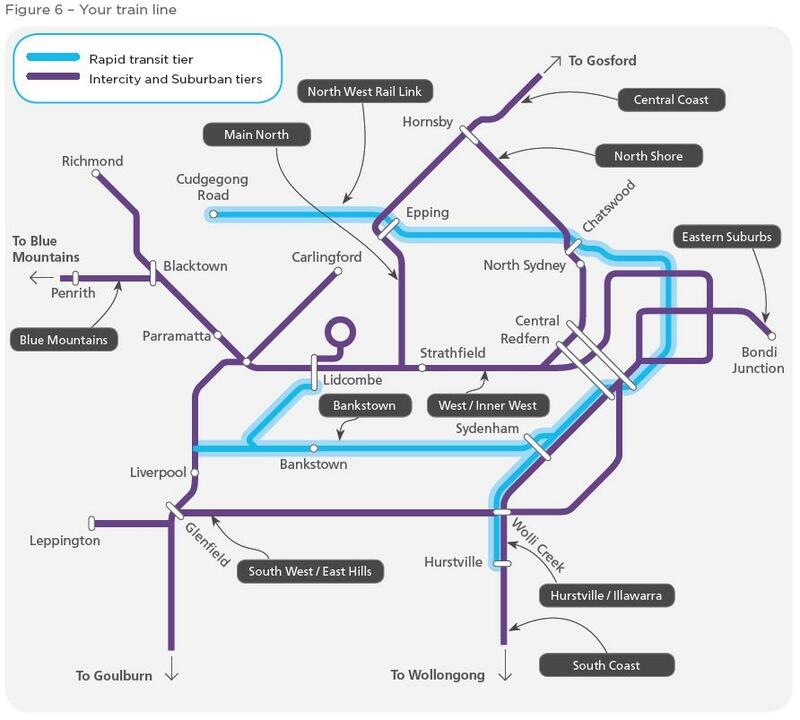 The reality is that these changes would allow for an additional 6 trains per hour to run on the North Shore Line (4 that now turn around at Chatswood rather than continuing into the CBD and 2 from existing spare capacity), an increase in capacity of over 40% for the North Shore Line. Signalling upgrades could increase this further to almost a 70% increase. The simplified timetable (which reduces the number of lines using that track from 2 to 1) also means fewer disruptions. The problem with this promise is really that it should never have been made in the first place, as it took the best option off the table (as dictated by the the lack of CBD capacity). The bigger mistake here would be to follow through on a bad promise, rather to bite the bullet and make the unpopular but right decision. Sidenote: I’m sure a lot of people will disagree with me on this. But I’ve never been a fan of oppositions making promises of what they will do in government before they know all the facts. I have a lot of respect for governments that do go back on their promises when they realise those were a mistake. Though I would have preferred that they not make a hollow promise in the first place. And I think she’s right. This is all part of a process to simplify Sydney’s rail network, so that each line is completely separate, with its own stopping pattern and own rolling stock. The mixed system currently means dropping to the lowest common denominator: a delay in one part of the network spills over to the rest of the network, express trains cannot overtake local trains, passengers wait for their specific train on overcrowded platforms rather than catching the next one causing long dwell times at stations, etc. Despite my personal misgivings towards a metro in the past, I’ve recently become a supporter of such an idea. A single deck metro system is off the shelf, meaning Sydney could just buy trains designed for the rest of the world rather than expensive custom made trains. If they are driverless, or atleast combine the role of driver and guard thanks to automation, then high frequencies can be maintained all day. And by moving to a private operator, this will also side step the bureaucracy and poor customer service of Railcorp and the resistant trade unions that value their working conditions above a good transport network. Tomorrow I’ll put up my third and final post on this topic. It will be about unanswered questions arising out of this announcement. An interesting video from the 1980s that shows planning for the design of the Tangara trains, it shows how long it takes for large number of people to board and disembark from a train, based on different carriage designs. The first is the traditional silver set carriage, which has bottlenecks that prevent people walking up and down the stairs more than one person at a time. The improved Tangara design has wider stairs, which allows people to go 2 abreast, thus increasing the speed at which they can board and disembark. This is important for dwell times: how long a train has to spend at each station. The longer this is, the fewer trains you can run per hour (the headways, time between trains, is longer) and the more one train’s delay impacts on the trains behind it. Almost 20 years on, the Cityrail network is on the cusp of retiring almost all silver sets once the new Waratah fleet comes online. Doing so could allow network wide improvements to speed and reliability due to shortened dwell times. Are there alternatives to the metro plan? I’ve already spoken about the proposal to convert part of the Cityrail network to metro which is being considered by the government as well as what sort of metro system is appropriate for Sydney. My opinion is that Sydney does need metros, but not this one. The metro proposal seems to be less about operation efficiency and more about transferring the rail system away from Cityrail and the Rail, Tram and Bus Union that have been holding the system back. 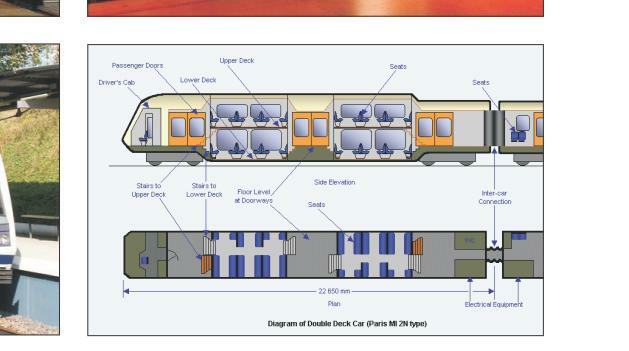 The current Cityrail rolling stock is made up of double deck trains with 4 doors per carriage (one pair on each side). Single deck trains, with their 8 doors per carriage, are therefore able to get passengers on and off more quickly and thus have lower dwell times at stations. 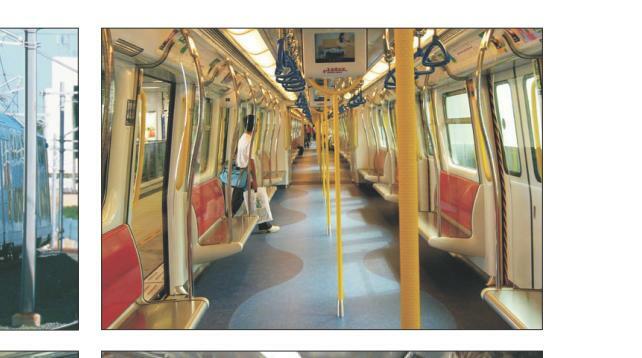 One possible compromise to this would be to retain double deck trains, but increase the number of doors to 6. The suburban rail network in Paris (RER) uses such trains, and its network is roughly the same size as the Cityrail suburban network (as opposed to Paris’ metro network, which services the CBD and inner city areas). There would be a slight reduction in the number of seats per train, but still significantly more than would be the case with single deck trains. Like the metro proposal, this would require new rolling stock. However, unlike the metro proposal, it would not cause a large transition problem in switching over from double deck to single deck trains whereby you would be forced to run trains at the lower frequency AND lower capacity of both single and double deck due to having to run both types of trains on the same line (until sufficient single deck rolling stock were acquired to run them exclusively). Cityrail trains were once made up of individual carriages which were combined together to form 3, 4, 6 or 8 car trains. They would be coupled and decoupled in order to form the right number of cars. From Tangaras onward, they would come only in 4 car sets, with two of these joined together to form an 8 car set. The Waratah train comes exclusively as an 8 car set. Despite this, they retain the connection between each carriage in which passengers cannot travel. This is some 6 square metres of wasted space between each carriage, or 42 square metres per 8 car train. At 4 passengers per square metre, this represents an unused capacity of 168 passengers per train, equivalent to almost 20% of the seating capacity of each train. As above, this would also require new rolling stock, but would also not cause any transitional problems that the metro solution causes. 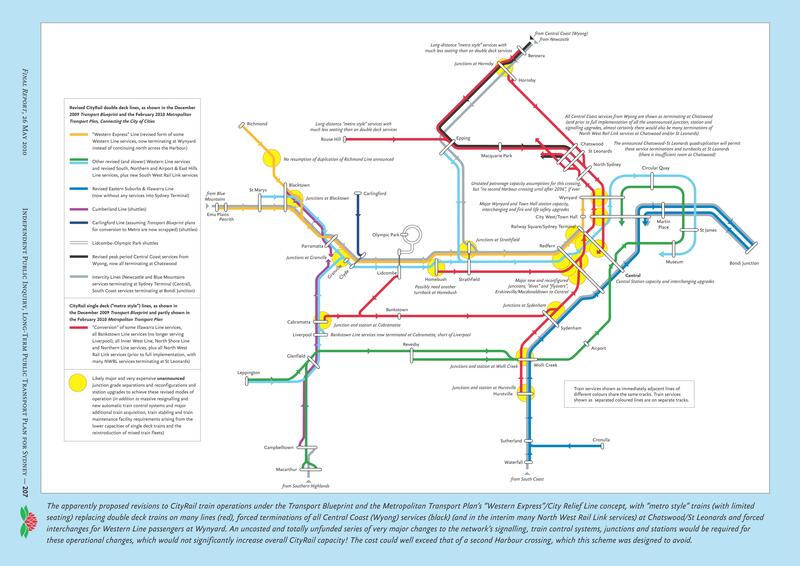 There are a few stations which currently act as choke points, Town Hall and Wynyard in particular. These stations were designed for a much lower number of passengers than they get today. There are two factors that cause this: they are too short and they are too narrow. 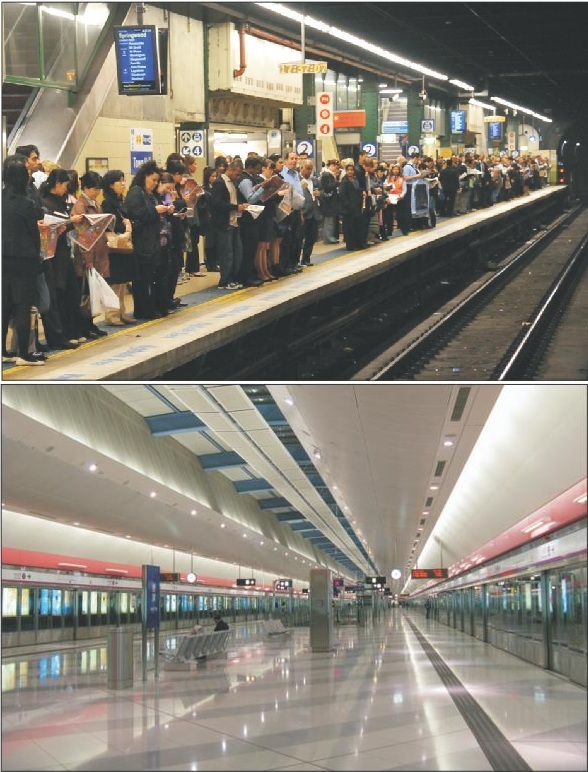 Short platforms restrict the maximum length of trains that can stop at them. For example, the V-Set interurban trains that come in from the Blue Mountains and Central Coast are too long for the city platforms, and all terminate at Central. The short length of these platforms also prevents 10 car trains from operating on them (an improvement that would instantly yield a 25% boost to maximum capacity). The width of platforms is also an issue, particularly in Town Hall (see photos on the left for comparison). The underground CBD stations are ones which not only see a lot of passenger traffic getting on and off trains, but also in changing over from one train to another. As the platforms aren’t very wide, this process can take a long time and also prove uncomfortable for passengers as they try to navigate through the narrow space available. Widening of platforms is quite difficult, almost nigh on impossible. The one thing you could do is to have platforms on both sides of the train and for both doors to open. One platform could be designated for boarding while the other for alighting. This is the system in place at Olympic Park station, which has to deal with tens of thousands of people coming in for big events. This was mentioned as one of the requirements for the metro proposal in order to allow for an increase in the number of trains per hour on each track. However, an improvement to the signalling system should also theoretically allow additional double deck trains per hour too, albeit not as big an improvement as for single deck trains. However, if you could increase the current maximum of 20 up to 24 trains per hour (compared to the 28 trains per hour touted in the metro proposal), then that is still a 20% increase in capacity. Together with the RER style double deck trains mentioned above and the lower station dwell times that they would allow, I can’t see why upgrading the signalling system couldn’t lead to some sort of an improvement on the current ceiling of 20 trains per hour. The point of the metro proposal was to avoid the expensive cost of a second Harbour crossing. However, a metro wouldn’t eliminate the need for a second Harbour crossing, only postpone it. There are many options for such a crossing, either on the Harbour Bridge (hanging off the underdeck or on the 2 Eastern Lanes in conjunction with a second Harbour Tunnel for motorists) or alternatively one that follows the Victoria Road alignment (which could quite easily be in the form of a metro). 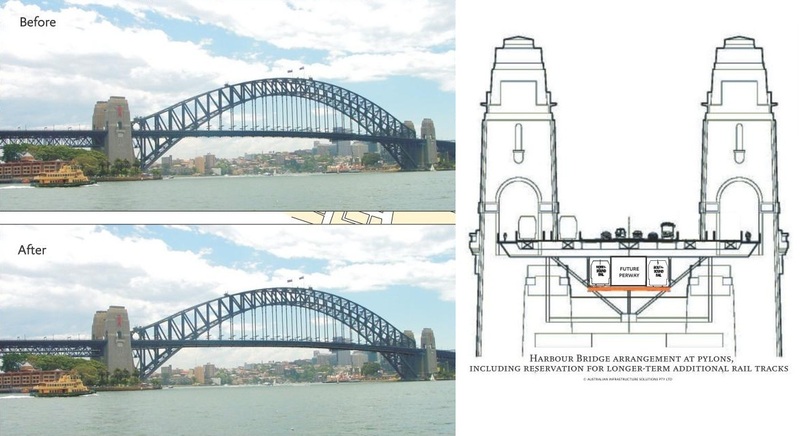 The Herald’s Public Transport Inquiry offered up the proposal to hang the new crossing under the Harbour Bridge, something which it claims can be done mostly within the existing structure. Before and after images are included, and if they are accurate, then I certainly can’t tell the difference. If increasing capacity is the aim, there are better ways to achieve this outcome than through the expensive and risky metro proposal. It would therefore appear to me that the real motive behind this proposal is an attack on Cityrail and the train union. Whilst I am sympathetic to this view, and think it would lead to better processes within the rail system, I personally think a better approach here would be to finish improving the heavy rail system in Sydney’s under serviced outer suburbs, then eliminate the bottlenecks in Sydney’s CBD, then begin creating an entirely new metro system (separate to Cityrail) from the ground up. Jacob Saulwick reports in today’s Sydney Morning Herald that consideration is being given to converting a third of the Cityrail network to a single deck metro style system. This proposal is one of seven being prepared for the update to Sydney’s transport plan due for completion next year, and is reportedly the one being pushed by Transport Department bureaucrats. The plan is not new, and an almost identical version was published in the Herald’s Public Transport Inquiry earlier last year, which also suggested a conversion to single deck trains (which I will now refer to as “metro”). The inquiry attacked the proposal for being costly and that similar benefits could be obtained much more cheaply by maintaining the existing double deck trains (which I will now on refer to as “heavy rail”). More on this later under “Disadvantages of the proposed metro solution”. Many single deck trains must be acquired. This is likely to take a number of years, based on the Waratah train rollout, and these trains could only be used during the off-peak until a critical mass are acquired to run them exclusively on certain lines. Using them during peak hour would reduce capacity without any improvement to frequency or speed. Changes to signaling in order to increase the number of trains per hour from the existing 20 to 30 required by a metro system. New dives and flyovers to shift trains from Bankstown and Hurstville onto the tracks that cross the Harbour Bridge (currently used by Western/Northern/North Shore Line trains). Construction of the City Relief Line, to allow Western Line and Northern Line trains from Parramatta and Epping respectively to continue through into the city. Shorter dwell times – Metros are able to have 4 doors each side per carriage, compared to the 2 doors that the current heavy rail trains have. This means passengers are able to board and alight the train more quickly, reducing the amount of time trains must spend waiting at each station. This is a particular problem at the moment at many CBD stations (Town Hall being particularly bad), where large numbers of passengers both board and alight from trains. Shorter dwell times also translate into faster journeys, as more time is spent moving between stations, rather than waiting at stations. 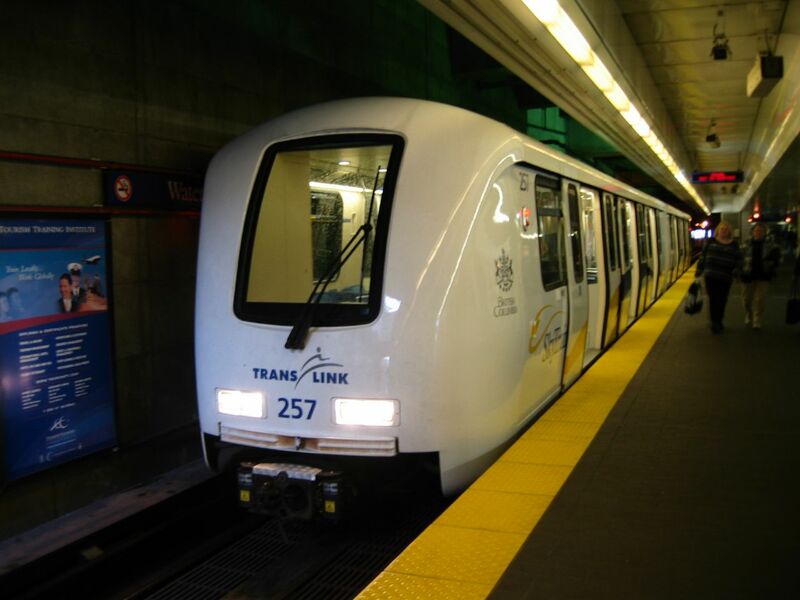 Shorter headways – Lighter metro trains are able to accelerate/brake more quickly, meaning that you don’t need as much space between two trains (known as “headways”). Current headways of 3 minutes per train mean the system is limited to 20 trains per hour on each track. If this could be reduced to 2 minutes, then it means you could run 30 trains per hour, a 50% increase. Cheaper than a second Harbour Crossing – This plan aims to increase capacity through the highly constrained existing crossing over the Harbour Bridge, but without having to either build a new tunnel under the Harbour (estimated to cost $3bn to $4bn) or converting 2 traffic lanes to rail (which would be hugely unpopular with motorists). Transport for NSW points out that with the Southwest Rail Link and Northwest Rail Link soaking up construction resources until 2019, an alternative to large scale infrastructure construction is needed to increase the cross-Harbour capacity before then. Cheaper rolling stock – Few other countries use double deck trains like Sydney does. By using single deck rolling stock, trains could be purchased off the shelf for a much cheaper price, rather than the over-engineered cost blowouts that we are used to (see the Waratah train as a case in point). 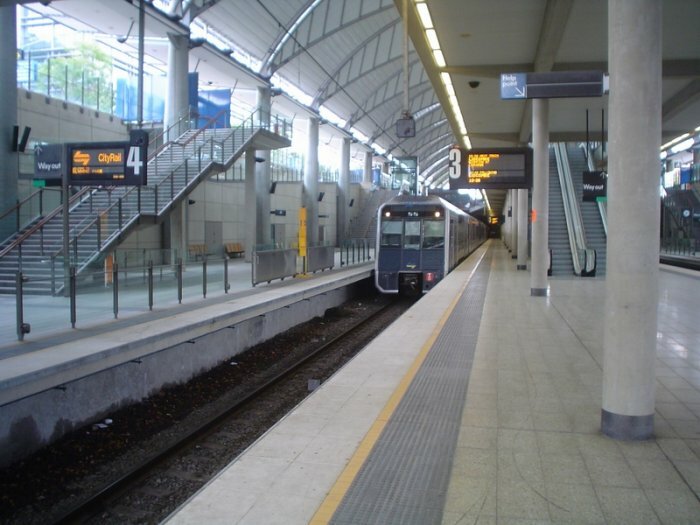 No net loss of seats – While metro trains have fewer seats than heavy rail (about 600 vs 900), the increased frequency means that there is no net loss of seats. Based on the current 18 trains an hour that cross the Harbour and proposed 28 per hour under the metro proposal, there would actually be an increase in total seats per hour of 600 (from 15,200 to 15,800), while standing capacity would double from 5,400 to 10,800 per hour. All up this is an increase of 6,000 passengers per hour, or 29% of the current capacity. Reduced operational costs – A new metro system would avoid the legacy labour costs of the current Cityrail system under Railcorp. Things like requiring both a driver AND a guard to operate each train. We no longer have drivers and conductors on buses (even Melbourne did away with conductors on its trams in the 90s). The Waratah trains are designed so that one person can operate both the driver and guard function, and there’s few reasons why they couldn’t, short of a strong union presence insisting guards be maintained. Ideally, it would be completely driverless, like in Vancouver. Those concerned about safety should remember that the incident at Waterfall was caused by the driver having a heart attack while the guard was asleep, and that the incident at Glenbrook occurred due to informal communication and not obeying rules. In other words, both tragedies (which resulted in a combined 14 deaths) may have been avoided had they been automated. Allows privatisation of metro system – Depending on your views, this is either an advantage or disadvantage. The current Liberal government would see this as an easy way to privatise a portion of the Cityrail network (likely by shifting operational responsibility to a private operator, as is done in Melbourne, rather than to sell the actual assets). A private operator, motivated by higher profits and without having the pressure of the electorate, would take a harder line against unions, achieving the previous advantage – reduced operational costs. More trains, staff and stabling required – A metro system would require 50% more trains that the current heavy rail system, and each of those trains need to be staffed by a driver and guard (unless union resistance can be overcome to reduce these) and the extra trains need to be stabled somewhere, necessitating construction of new stabling yards on top of the existing ones in place. This will lead to both additional capital and operational costs. Increased capacity comes from standing, not seated passengers – This is particularly a problem for long distance passengers (such as on the Northwest/Macquarie Line). For example, Epping to Central via Macquarie is currently a 40 minute trip, and with Northwest Rail Link passengers getting on at Castle Hill or Cherrybrook potentially taking all the seats, this means a 40 minute standing room only commute into the city. Cityrail policy is that no commuter should have to stand for more than 20 minutes, and while this is unlikely to be a problem at the extreme ends of the network (the trains here are empty and seats are plentiful), it makes metro style trains unsuitable for long distance routes. Significant infrastructure still needed – In order to get Western Line passengers into the city, an additional City Relief Line must be built through the city. This is at considerable cost ($4.5bn at last count). This is in addition to changes to the signaling system and dives/flyovers required to get trains onto the appropriate track. A second Harbour Crossing would increase capacity more – There are currently 4 tracks approaching Chatswood (from Epping and Gordon) and 4 approaching Central (on the East Hills and Airport Lines) that truncate to 2 tracks. By constructing a new set of 2 tracks through the city (the City Relief Line), across the harbour (a Second Harbour Crossing) and up to Chatswood (the Chatswood to St Leonards Quadruplication) then it would allow an additional 20 trains in each direction across the harbour and through the city. That means an increase in capacity of around 24,000 passengers an hour (most of them seated), compared to only 6,000 under the metro plan (virtually all standing). Loss of flexibility – Mixing single and double deck trains on the same track will significantly reduce capacity, either due to fewer trains an hour or fewer seats per train. As a result, the metro and heavy rail systems must be entirely segregated during peak hour, leading to a loss of flexibility. Deferral of the Parramatta to Epping Line – Under the proposal, the Parramatta to Epping Rail Link would be deferred until 2036. And even then, the line would operate only as a shuttle service, running between Parramatta and Epping. Previous proposals had trains going through to St Leonards (with a quadruplicated line between Chatwood and St Leonards), before turning around and returning to Parramatta. This would link the key centres of Parramatta, Macquarie, Chatswood and St Leonards, with existing lines allowing for direct travel into the CBD. Signaling improvements can apply to heavy rail too – Something often overlooked is that the improvements to signaling required to increase frequency to 30 metro trains per hour could probably also increase heavy rail train frequency too. 24 double decker trains per hour would be a 33% increase in on the current 18 per hour, greater than the 29% mentioned earlier, without most of the other problems associated with a shift to a metro. For me, it is the last point in disadvantages that decides it for me. If signaling changes (required for the metro proposal) can allow for an increase to 24 trains per hour using the existing rolling stock, then the entire proposal should be junked. Instead, effort should be focused on completing the Northwest and Southwest Rail Links, followed by lines already proposed and waiting for action: Parramatta to Epping and a new connection between Refern and Chatswood (the City Relief Line, a Second Harbour Crossing and Chatswood to St Leonards Quadruplication). That, along with the mandatory complaint of “another plan?”, makes me hesitant to support the metro proposal. I can only hope one of the other 6 proposals does more to increase capacity, frequency and/or speed on the network than the one seen on the news today.